Absinthe is a distilled spirit produced from wormwood macerate and wormwood distillate. Since the neurotoxin thujone contained in wormwood, it came about, that absinthe was declared in 1923 as a drug of intoxication, and was therefore banned due to a law in Germany. The definition of absinthe comes by the way of the Latin derivative for wormwood: Artemisia Absinthium. Since 1998, absinthe was approved by limited thujone content again due to more modern technology and analysis methods, that could wane the risks of absinthe production. In normal absinthe a maximum thujone content of 10 mg / kg is allowed. 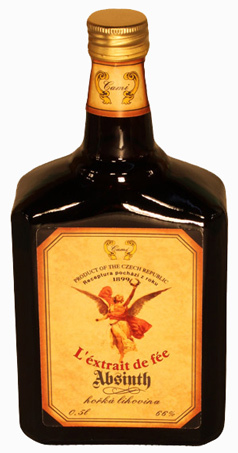 Is an absinthe declared as a bitter spirit, this exception may have even up to 35 mg / kg thujone in europe. Absinthe can be produced by several methods of preparation: High considered is the distillation method, in which individual herbal components first are macerated and later distilled together in a distillation apparature. So this Absinthe should not taste bitter at skillful distillation since the absinthin is separated from the wormwood extracts. It so happens that the wormwood instead of bitter even more taste slightly sweet. But if an absinthe is only macerated and is later only filtered, it can in an inferior manufacturing technology, which was not carried out by an experienced distiller, come to a bitter taste . Responsible for this signs the absinthin, which is the bitter substance of wormwood. But there are also excellent macerated absinthes, that does not even have to taste bitter, if properly applied technology is used. Ultimately, however, many of our customers want to have a slightly bitter taste, because currently also dark chocolate is very popular at us. The combination of a slightly bitter taste with the sweetness of sugar cube at the absinthe preparation, resulting in a classic combination can rejoice the palate. You can also say, that the taste preferences for each absinthe drinker are subjective and taste can supposedly do not argue. So, as incipient absinthe connoisseur, you should test very much in the beginning, to find out your subjective preference and taste. The taste differences in absinthe are often very large. The individual regions, where Absinthe is drunk, have regional differences. Is Absinthe in Spain known with lemon balm, it is the flavor of star anise in France or the wormwood flavor in the Czech Republic. Many variants are possible here. Test yourself through the absinthe world and so find out, which absinthe itself tastes best to you.